Extended functionality for the Brizy WordPress builder plugin. Customise the dynamic parts of WordPress websites with the same ease-of-use that Brizy has pioneered. As we advance in the development cycle, we plan a deep integration with tools like Pods, ACF & Toolset. Give your website a great beginning with our premium pages and themes. You might want to begin with a blank page and let your imagination guide you, but if that’s a little too intimidating, just start with a beautiful pre-designed template. Beside the basic headers & footers that you can create with Brizy Free, the PRO version comes with the advanced features you would expect: sticky header, pre-made designs and more. Use premium fonts from your Typekit account, integration with mailing platforms like MailChimp or Campaign Monitor, add gorgeous images from Unsplash, etc. These 3rd party integrations will enhance the functionalities of your website, without adding unnecessary complexity. Design pop-up banners, call-to-action windows and so much more with our powerful module, especially designed for marketers and agencies. No need to learn anything new, it’s all done with the tools you already know and love from our page editor. The Manager Role allows you to limit what your clients will be able to edit. This safety net will prevent your clients from interfering with the structure & the design of the page. Brizy Free already comes with a perfectly usable contact form, but we’ve saved the most powerful features and the best ideas for the Pro version. Using the A/B split testing you’ll be able experiment with two or more variants of a page for a better conversion. 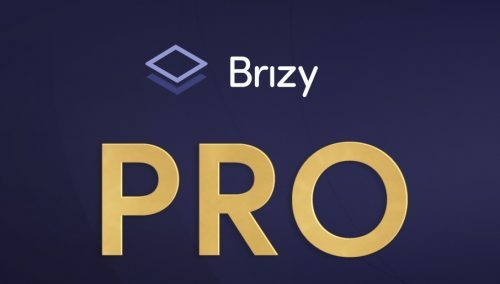 You’ll be able to brand Brizy with your own company logo and name. All backend & front end references will be removed. Brizy is multisite compatible, but you can not use it to create a WaaS / SaaS cloud based service for your clients.